Margery Williams Bianco (1881-1944) was an English-American author of popular children’s books. Her family moved to the United States in 1890. She returned to England in 1901 where her first stories and a novel were published. Her story “The Blue Dragon” was included in The Emerald Fairy Book, Ralph Tuck & Sons 1901 (under the name Margery Williams). Margery married, travelled in Europe, had two children, and returned to the United States after World War I. She found lasting fame at forty-one with the 1922 publication of her best-known work, The Velveteen Rabbit. It was her first American publication. Margery continued to write for children and young adults. She died just as her final book, Forward Commandos!, went on sale in 1944. 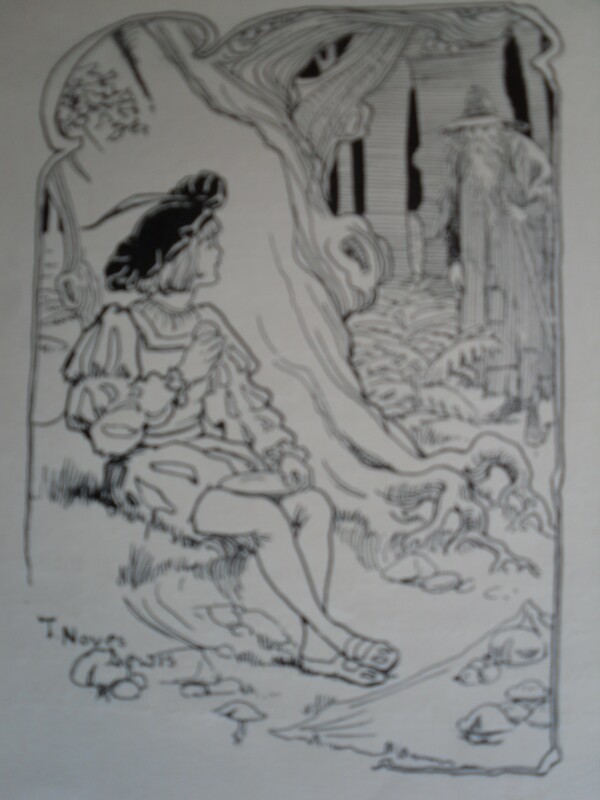 Dorothy began her career in England working with her father, illustrator Harry Furniss (1854-1925). He contributed over 2,600 drawings to the famous British magazine Punch and illustrated two of Lewis Carroll’s books. While much of Dorothy’s work was in collaboration with her father, she found her own opportunities, such as The Emerald Fairy Book and Eve’s Adventures: a submarine fantasy in 1904. The family moved to America in the early 1900s where Harry pioneered the first animated cartoon film for Thomas Edison and wrote a number of books. 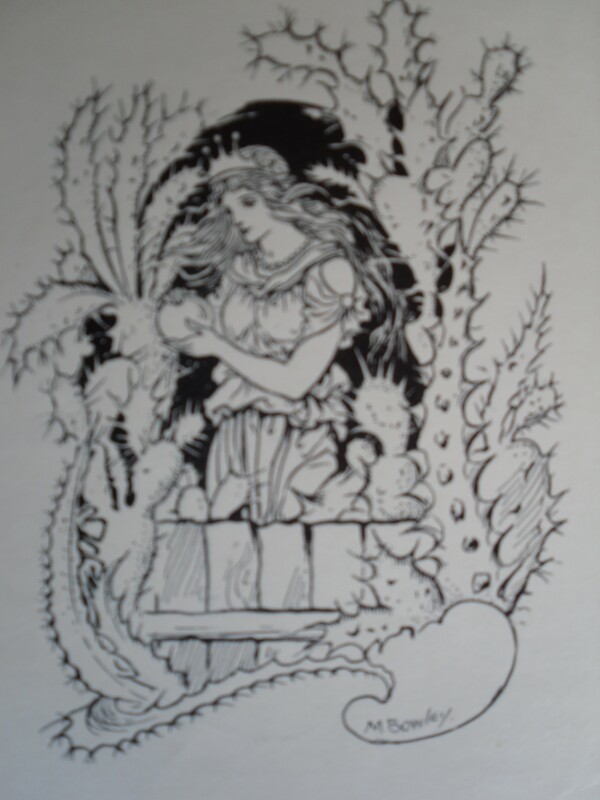 Dorothy continued as an illustrator and also produced several books on drawing. Thomas Noyes-Lewis (1862-1946) was primarily known for his religious illustrations. He occasionally produced work such as this image for The Emerald Fairy Book. Frances Brundage (1854–1937) contributed six full-page, color illustrations to The Emerald Fairy Book. She was an American illustrator known for endearing images of children. Her father, Rembrandt Lockwood, trained her as an artist. He abandoned the family when Frances was 17. She was able to support herself with her art skills. In 1886 she married artist William Tyson Brundage. Frances’ first published professional work was a sketch illustrating a poem by Louisa May Alcott. The work was purchased by Ms. Alcott. In the 1890s, illustrator Maud Humphrey was the favorite of American publishers. However, international publishers Raphael Tuck & Sons in London, and Wolff Hagelberg in Berlin, chose Frances’ work for their American market publications. From 1899-1910 she was the largest presence in U.S. art paper. Her illustrations appeared in children’s books and on postcards, advertising cards, and paper dolls. A Rover he would be. Clifton was born in in Bristol, England. Soon after his father’s death, he entered the family’s extensive bookselling business at the age of 16. When his mother died (about 1881) and the bookselling business was sold, Clifton joined the staff of the Cheltenham Examiner as drama critic, among other assignments. He also began to contribute short stories to newspapers and magazines. At his death, The London Times reported he had published 1,650 songs. Clifton Bingham provided many verses for the lavishly printed picture books produced by Raphael Tuck. Grandpapa was Joseph Henry Collins of England. He owned an international mining consulting company, J.H. Collins & Sons, Mining and Metallurgical Engineers located in London. Two of his sons, George and Arthur (born 1868 in Turo, Cornwall, England), came to America in 1894 to manage company mining interests in Colorado. The following year, Arthur married Margaret Morton Becker, daughter of Judge Clayton F. Becker. The couple had two sons: Arthur Jr. and Lawrence. In 1899 Arthur Collins became general manager of the Smuggler-Union Mining Company which operated a silver mine near Telluride, Colorado. Arthur made changes in mining operations that angered the miners and their union. He refused to bargain with the union and 350 miners walked off the job on May 1, 1901. After a shooting incident and intervention by Arthur’s older brother, George, the strike was settled. On 19 November 1902, Arthur was playing cards in the mine manager’s house. An unidentified person poked a shotgun through the open window and mortally wounded Arthur. Governor James Orman ordered the rail route cleared so that a special train carrying two doctors and Mrs. Collins could race non-stop from Denver to Telluride. The doctors were unable to save Arthur and he died the following day, November 21, 1902. The Emerald Fairy Book, part of Father Tuck’s Golden Gift Series, is a lovely collection of stories by various British authors with illustrations on every pair of pages. Read more about the authors and illustrators in the next several blog posts. Stories and Poems by Clifton Bingham, Grace C. Floyd, M.A. Hoyer, etc. Illustrated by F. Brundage, Dorothy Furniss, T. Noyes Lewis, etc. Published by Raphael Tuck & Sons, Ltd. Printed in England as part of Father Tuck’s Golden Gift Series, with stories by various British authors, including Clifton Bingham, Grace C. Floyd, and M.A. Hoyer. Beautiful illustrations enhance every pair of pages.